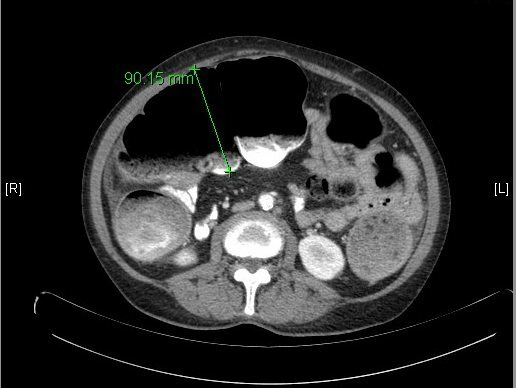 A 65-year-old female was initially diagnosed with bilateral ovarian carcinoma with mechanical large bowel obstruction. She underwent exploratory laparotomy for pneumoperitoneum and was found to have a descending colonic mass, which was resected at the time of operation. Intra-operative pathology was suggestive of primary ovarian adenocarcinoma, however postoperatively her tumor marker pattern and final pathology report revealed metastatic primary colonic adenocarcinoma. Krukenberg tumor is an uncommon clinical diagnosis. The clinical presentation is often muddled, therefore a high degree of suspicion for the diagnosis is warranted as mis- identification of the nature of the primary tumor can have dire implications for patient outcomes given the vastly different natural history of colonic adenocarcinoma and ovarian mucinous adenocarcinoma. Certain clinical features and tumor marker patterns can be suggestive of correct diagnosis, but alone are insufficient. Immunohistochemical staining of pathology often verifies the diagnosis. When bilateral ovarian metastasis is encountered at operation, metastectomy is associated with improved survival. Overall, Krukenberg tumors have a poor prognosis. Krukenberg tumors, non-gynecologic primary tumor with bilateral ovarian metastasis, can present a diagnostic dilemma to the clinician. Often patients have features of both ovarian malignancy, as well as that of the primary tumor. Correct diagnosis of the primary malignancy has implications for management of the tumor, as well as prognosis for the patient. Krukenberg tumors can originate from a variety of anatomic sources, most commonly the gastrointestinal (GI) tract (colon, stomach, pancreaticobiliary) followed by breast tumors. Up to 20% of ovarian tumors are metastatic in nature 1 . Many metastatic tumors are from GI origin (colon, stomach, pancreaticobiliary 2 ) as well as from the breast. Bilateral ovarian enlargement can prove to be challenging in clinical diagnosis. Often clinically the patient presents with features of both an ovarian malignancy as well as features of an alternative primary site malignancy. Surgically gross features of the tumors can also be ambiguous as many metastasis to the ovary tend to be cystic in nature even though the primary tumor may not be cystic in nature. 1 The surgical approach to ovarian primary malignancy is distinctly different when compared to that of metastasis to the ovaries. Additionally post-operatively prognosis and chemotherapy regimens differ with regard to each malignancy. This patient presented with bilateral ovarian enlargement and colonic distension who presented a challenge diagnostically to determining whether the primary malignancy was colonic or ovarian in etiology. She was ultimately determined to have a colonic Krukenberg tumor. Her case will be reviewed, a discussion of this elusive diagnosis as well as review the literature regarding treatment of this relatively uncommon condition will also be reported. A 65-year-old Hispanic woman with past medical history of hypertension, diabetes, and hyperlipidemia presented with abdominal pain for the past three days associated with nausea and vomiting. Laboratory work up was revealing of diabetic ketoacidosis with glucose of 317mg/dL and anion gap of 14 with small amount of serum ketones. White blood cell count was elevated at 14,700/mm^3. 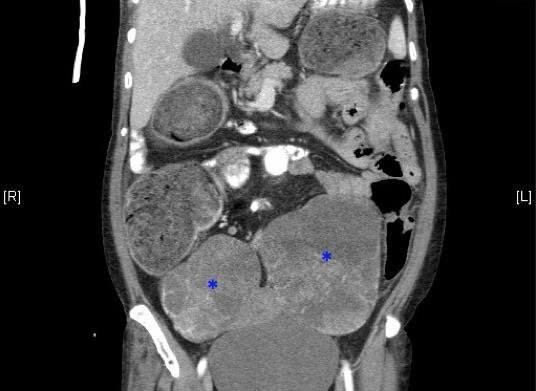 She underwent CT of the abdomen and pelvis [fig. 1]	[fig. 2]	which revealed marked dilation of the colon to the level of the distal descending colon, a serosal implant near the constriction, left para-aortic node with central necrosis, and large bilateral multiloculated cystic adnexal masses; left 12×9.8x11cm and right 9.2×7.8×9.7cm. She reported passing flatus and having bowel movements. She denied previous colonoscopy. She was seen by both the surgical and the gynecologic consultants in the emergency department, each agreeing that it was likely adnexal neoplasia causing extrinsic compression of descending colon and serosal implantation. She was admitted for treatment of diabetic ketoacidosis, further work up of the adnexal masses, and observation of the partial large bowel obstruction. Diabetic ketoacidosis was treated with fluid administration and insulin with resolution of her anion gap as well as blood glucose normalization. Her colonic dilatation was followed with serial abdominal exams and an abdominal plain film radiograph. Although her serial abdominal exams remained benign with softly distended abdomen and palpable masses without tenderness to palpation or peritoneal signs, a subsequent radiograph revealed pneumoperitoneum. She was taken to operating room (OR) for emergent exploratory laparotomy. Intra-operative findings revealed cecal perforation. She underwent right hemi-colectomy for her colonic perforation, and then bilateral salpingo-oophrectomy and total abdominal hysterectomy by gynecology- oncology. Ovaries were sent for frozen section, which was suggestive of primary ovarian adenocarcinoma. Attention was turned to the serosal implant near the descending colon, which revealed a colonic mass in the descending colon. A left hemi-colectomy and omentectomy was further performed. She returned to the OR the next day for possible closure and abdominal washout in tandem with gynecology and oncology (Gyn/Onc) for potential para-aortic lymphadenectomy. She remained vitally unstable during the case requiring new use of vasopressor medications. The procedure was terminated after abdominal washout. A temporary abdominal closure device was replaced and she was returned to the ICU for further hemodynamic support. Her tumor markers returned prior to definitive closure and were suggestive of colonic malignancy. CEA 834ng/dL (N=0-2.5), CA 19-9 1558 U/mL (N=<34), and CA-125 8 U/mL (N=<21). Her specimens were again reviewed by pathology and her diagnosis was revised to colonic adenocarcinoma with ovarian metastasis. Given her critically ill nature and tumor marker pattern, as well as advanced cancer, Gyn/Onc felt there would be little benefit to para-aortic lymphadenectomy. She underwent abdominal washout with ileo-sigmoid stapled anastomosis and diverting loop ileostomy, abdominal wall mass resection, and primary abdominal closure. Final pathology revealed: perforated cecum with patchy transmural inflammation and necrosis, left ovary measuring 14x13x9cmm, right ovary measuring 11x8x8cm, both partly cystic and necrotic with metastatic adenocarcinoma from colonic primary. Descending colon mass with moderately to poorly differentiated adenocarcinoma. Abdominal wall pathology was negative for tumor and instead revealed a chronic foreign body reaction. Immunohistochemical staining was positive for CK20, CDX2, and CEA as well as negative for CK7. She was discharged after uneventful recovery. She was readmitted one month after discharge for loop ileostomy reversal. She underwent the procedure without complication and was again discharged home after uneventful recovery. Ovarian primary malignancies require staging with surgical removal of the uterus, adnexa, omentum, and para-aortic lymph node tissue. Conversely colonic tumors are managed with left or right hemicolectomy dependent upon the location of the malignancy. When the colon is identified as the site of primary malignancy with ovarian metastasis the tumors are most commonly located in the rectosigmoid colon followed by transverse colon, ascending colon, cecum, and descending colon (in order of decreasing frequency). 6 In the case of an ovarian metastasis of a colonic cancer, the ovaries should be removed, as this is associated with improved survival. 7 Intra-operative frozen section performed by a gynecologic pathologist if possible, can be useful to determine the course and extent of the surgical resection for appropriate staging. Ovarian metastasis in colorectal carcinoma is associated with poor prognosis. Median survival time described in some case reports is 6-18 months. 1 Five year survival overall has been previously described as 22%. 8 Resection of the ovarian metastasis is associated with an improved outcome when the disease is confined to the pelvis, with median survival equal to 31 months. 7 Poor survival may be in part due to the advanced stage of these tumors. The National Cancer Institute’s SEER database shows observation survival rates for stage IV colon cancer as 6%. 9 There is also report that Krukenberg tumors are more resistant to chemotherapy. In one small study by Goere, chemotherapy resulted in stabilization of disease in CRC patients with extraovarian metastasis in 65% of patients (n = 15), progression in this group was observed in 35% (n = 8). However in the group with ovarian metastasis stabilization of disease was only achieved in 13% (n = 3), progression in this group was observed in 87% (n = 20) p value = 0.0005. 10 Despite this there are several reports within the literature that patients who achieve R0 margins with their resection have been cured of their cancers analogous to patients with metastasis to the lung or liver who undergo metastectomy at those sites. 1 7 Aggressive surgical resection can be warranted for a young patient presenting under non-emergent surgical conditions. This patient presented with features more consistent initially with an ovarian primary and extrinsic large bowel compression. Although she had bilateral ovarian masses, the size was more indicative of ovarian primary. Her CT showed a necrotic para-aortic enlarged lymph node with central necrosis, which is more consistent with the pattern of spread for ovarian cancer; however the obstructive picture was a potential clue to her diagnosis of Krukenberg tumor. She received appropriate resection of her malignancy despite the emergent circumstances of her initial surgery. Immunohistochemical staining was essential to her accurate diagnosis of colorectal adenocarcinoma with bilateral ovarian metastasis. 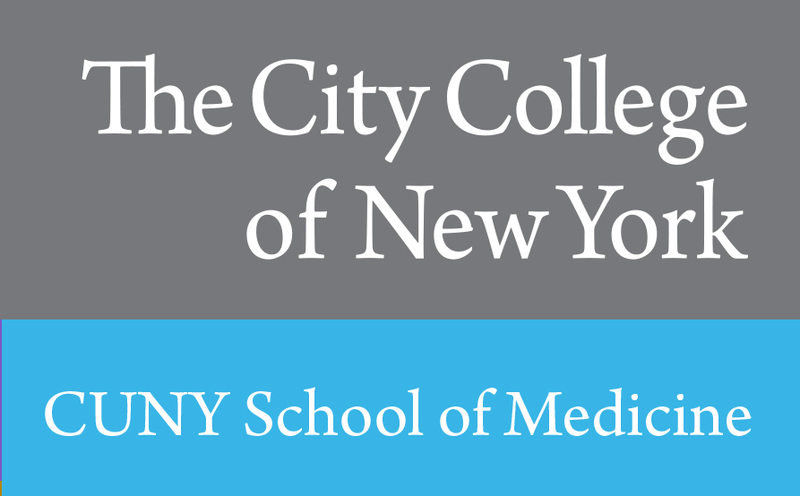 This case highlights the importance of maintaining a high degree of suspicion for a Krukenberg tumor in the setting of bilateral ovarian masses, as misdiagnosis of these tumors can have adverse outcomes. Figure 1: Colonic dilatation without evidence of free perforation. Figure 2: Bilateral cystic looking ovarian masses with colonic distension containing stool (Labeled with asterisks). M. Amberger collected the data and drafted the manuscript, participated in writing, revising and approving the final manuscript. M. Amberger would like to thank the following people for their contributions to this case report; St. Barnabas Hospital Pathology Department, St. Barnabas Medical Library.